What is your favorite Whisky? Home » Archive » What is your favorite Whisky? 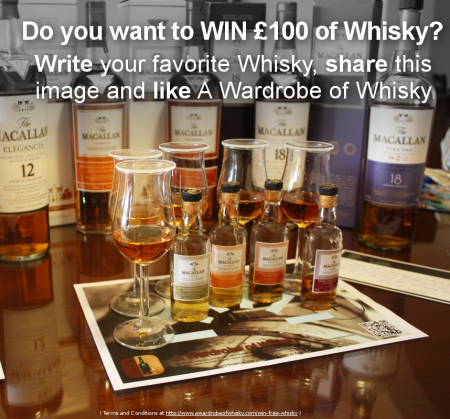 As part of our celebration of A Wardrobe of Whisky’s third birthday, I am giving away a £100 bottle of whisky, so for an extra chance ( each day I will add a new task ) you can share with us your favorite whisky. So today for a new chance to win a fabulous single malt whisky, add a comment with your favorite whisky and share this post. One more chance to win a fantastic bottle of single malt whisky, and yes, £100 can still buy very good whisky. If you lack of inspiration you may want to check what whiskies others recommended or some of my favorite and best whiskies reviews. Please refer to how to win free whisky about exact terms and conditions ( mainly stuff about +18, end date of the give-away, and shipping conditions ).